Are you a planner or are you a pantser? A planner is someone who plans out every detail or at least many details before they start working on a project. A pantser is someone who says "I gotta do this project" and then dives in and figures it out as they go. Frankly, I am not sure which one is better? Regardless of how you do it there are 11 to 12 things that you will always need to decide on when it comes to a blog post. Sure there are more decisions and efforts that go into blogging than these but these are the core ideas that you must figure out for every blog post. Your blog post title steers the ship for what your reader can expect when the click on the link. It also steers the ship for you as the author of the blog post. The reason that I say "working title" is because at the planning stage of a blog post, you have a general idea of what your blog is about. However, we all know that once you start writing and creating it could grow, evolve or change. So once you are done with your post come back and revisit your title. ​WordPress will automatically set your original blog post title as your permalink but you can change this. Just make sure that you change this prior to publishing your blog post. I don't recommend changing it after publish. When do you want this blog post to publish? I use a printed calendar and Co-Schedule to track and plan my blog post publish dates. Does your new blog post that you are planning fit into one of your current categories? If not, ask yourself if this is the right time for you blog to launch a new category. Also, tracking your categories in advance will keep you from having an unbalanced blog. Blog tags are a tricky topic. I am pretty sure that every single blogger handles them in a unique way and I also think that is ok. I tend to make my tags my keyword phrases for the particular blog post. The downside to this is that I have a lot of tags. If consistency is important to you then you may want to create a working list of tags and choose from them each time. This is an optional item in the list. It purely depends upon your blog theme design. For example, on my blog here I could have a unique featured image and a unique top image on a post. While, I am not a fan of this some people really enjoy that unique experience. If that is the case with your blog, you just have to add it to your planning list. This is your moment to ask something of your reader. If you have comments turn on then you want to give your reader a reason to leave a comment. Open ended questions inspire conversation and on a blog post, that is a wonderful thing to have. If you downloaded your image from a free site or somewhere such as FLICKR, you will likely need to provide image credit. It is easy to get so caught up in the content that you forget this important step. My suggestion is to create yourself a checklist and make sure that this is on it. SEO folks will tell you that you don't have to do this anymore but I say that it sure doesn't hurt. This is completely option but 2 or 3 of your keyword phrases, will not hurt and may someday help you again. If you don't fill this out, Google will just make it up for you. Generally, in that instance it will be the title to your blog post. However, if your title is long, it will be cut off. This is why I highly recommend that you fill it out for yourself and make sure that it is enticing. Again, if you don't fill this out Google will do it for you. In this instance they generally pick up the first sentence from your blog post. Often times that is not the most enticing meta description. This is why I recommend that you always fill this out with a short description of what the blog post is about. So those are 12 quick reminders of what we need to consider with every single blog post. The fact is, blogging is a lot of work and there is a great deal to consider. 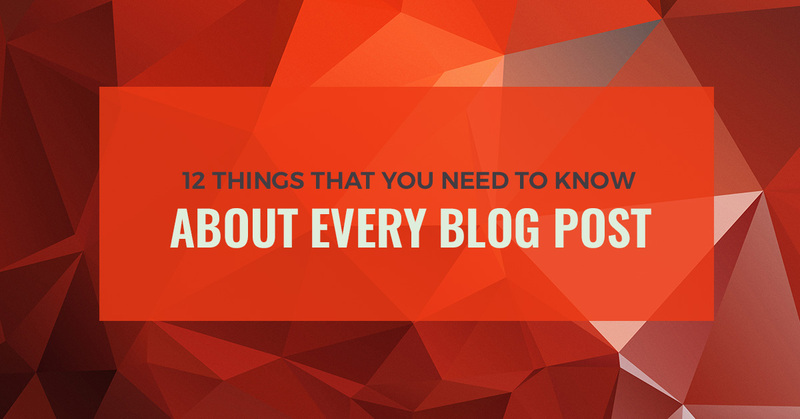 If you keep these 12 blogging tips in mind, you will be way ahead of the curve.